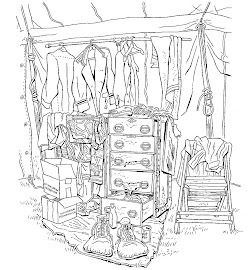 ART LA RUE: "The Circus Cop"
Art's career is not too well documented so adding research in my book did some real doing and lots of LUCK. I noticed that someone had mentioned that Pepito Perez, was in the 1953 movie "Here come the girls",...Other clowns were in the movie although NOT given credit in the cast listing; Fred Sweeney, Pat Morgan, Bobby Kay AND ta-da,...Art LaRue. Art is not listed in the IMDB cast listing and I have submitted the info to them but it has not been added. ALSO I submitted info TCM movie website. I have the video and as soon as I can figure out how to send video I will do so. Or maybe someone else has the video and can offer the clips. 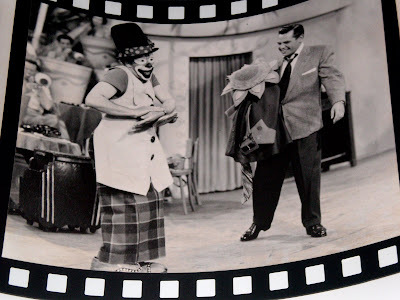 The film is a lot of fun and I believe, if I remember correctly the Clowns do a runabout near the end of the film as Bob Hope is being chased by the villian. Art LaRue is clearly seen but on camera fleetingly. I have added three photos of Art with this message. Maybe folks can add more info on Art LaRue. 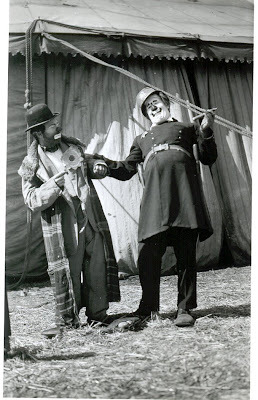 The shots are: An early shot of Art LaRue in white face with another (unknown to me) clown. 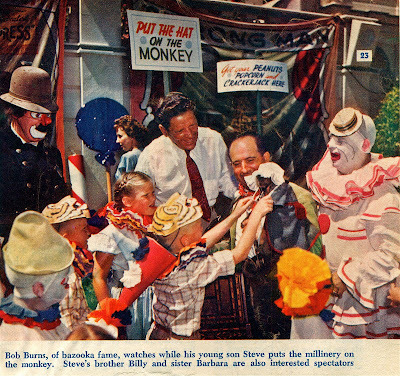 This color shot features Art (left) and California clown Larry "Bozo" Valli (right) from 1955/56. An original shot of Art taken in April of 1946 on the Clyde Beatty show, note the full shot was used in the very first Bozo Record Reader Capitol records produced in 1946. He was never given credit for this untill (now) and in my book. Peggy Williams and Danny Chapman in the early 70s. There must have been hundreds of photos taken at this session. I've seen pictures of Uncle Soapy, Frosty, Jim Howle...others of Peggy and Danny. Anyone out there know more about the photographer or the circumstances under which they were taken? 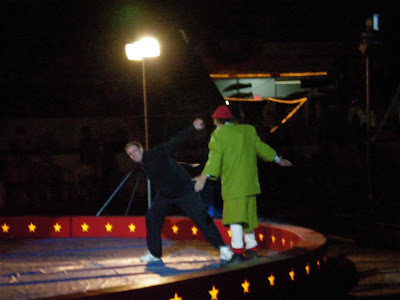 Steve Lough and Nathan Carver perform a quick version of the Washer Women Gag to cover a set change at Circus Kinoshita in Japan, 1994. While digging around for a few photos for Buckles, came across this shot of Danny Chapman and me. Think it was taken at the Venice winter quarters in the late 1960s. Maybe early 70s. 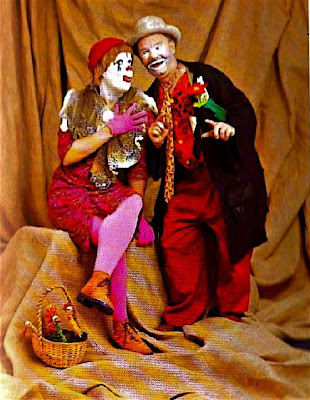 We are just goofing and wasting the Ringling photographer's film as is quite obvious. (Yes, film! This was decades before digital photography.) 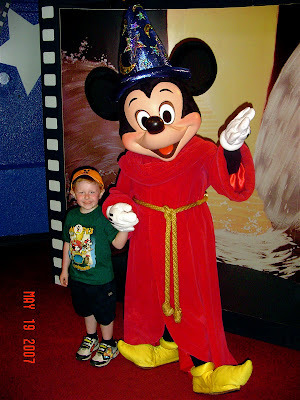 Don't recall ever seeing Danny's photo on your blog so thought you might enjoy it. 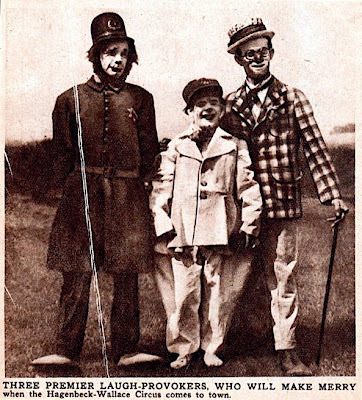 Danny, as you likely know, was a major player in the first Clown College term. He also worked with Bill Ballantine in later sessions. 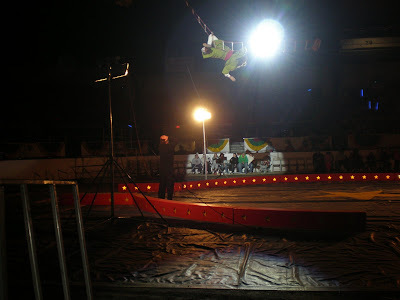 Mel Miller, the original "dean" was a circus historian and museum guy. 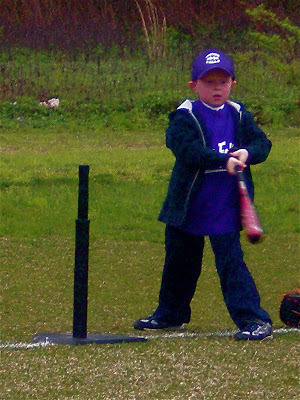 So it was Danny who really spearheaded the clowning instruction that first year. Worked a lot with the class to develop personal makeup too. The Felds sent various clowns down from the touring shows -- Lou, Otto, Bobby etc. -- to spend a week or so working one-on-one with the class. Remember that Lou only spent part of the day at what I called in news releases "the insane institute of higher hilarity." He always found time for an activity he loved just as much as clowing -- fishing! 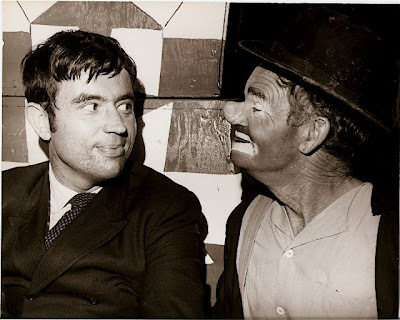 I have heard some people say that the whole Clown College idea was Danny's and that he put that bug in Irvin Feld's ear. Can't confirm that but was there at the creation and do know Danny was very key in getting the College concept up and running. Yesterday the family and I went to Universal Studios Orlando to ride the new Simpsons ride. 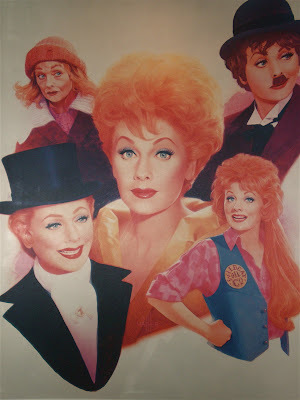 While we were there I visited their tribute to Lucille Ball and found not only the portrait above (which looked at first sight like it had been done by Jim Howle, but wasn't) but also a photo on the wall of Jose "Pepito" Perez and Desi Arnaz from episode 52 of “I Love Lucy”, “Lucy’s Showbiz Swan Song”. I also found the pilot on DVD (I Love Lucy, first season, volume one) which I don't think that I've seen since it first re-aired on TV. Whenever I read mention of Pepito I kept thinking of Pat Moran as Buffo, who appears in "The Audition" (I Love Lucy, first season, episode six). And this photo from the DeSanto Archives. Whoever it was that said that Pepito looked inspired by Windsor McKay hit it right on the head. 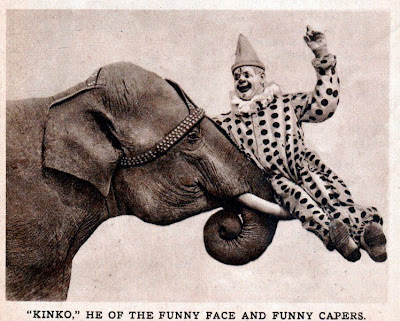 He looks like he stepped right out of Little Nemo in Slumberland! 2007 Felix Adler Award winners Greg and Karen De Santo doing the classic Washer Woman, adding several more bits than usually seen in this gag. In response to yesterday's photo of Pepito here is a photo of Ramper, the inspiration for Pepito's makeup. 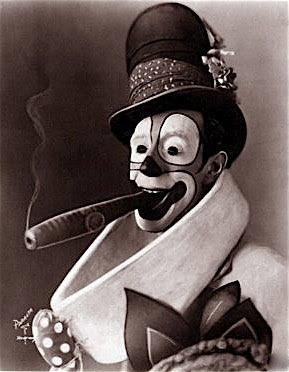 The attached picture is of the Spanish clown Ramper (Ramón Álvarez Escudero, Madrid, 1893- Sevilla, 1952). 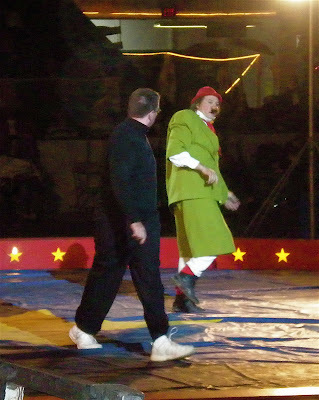 He was, along with Tonetti, the most famous clown in his country. As with the Fratellinis in France, he inspired lots of illustrated books and children's toys, today priced collector items. I LOVE LUCY: "The Audition"
A clip from "The Audition", the first season episode of "I Love Lucy" which features Lucy and Desi performing their nightclub act featuring the cello built by Pepito and comedy direction from both Pepito and Buster Keaton. First aired November 19, 1951. I don't know who this guy is but I sure like his style! 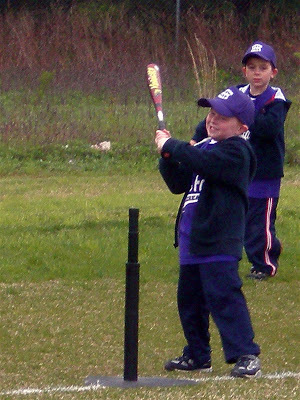 Look at that hat! That collar and tie! That flower! 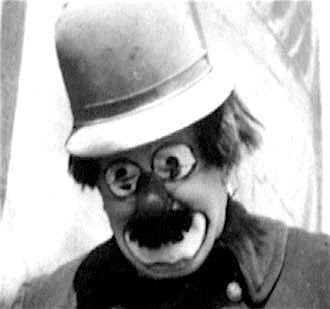 The way that the huge circles of white around his eyes work with the small black circles over his eyelids to give the illusion of a 1920s comic strip or cartoon character. He looks like he was designed by Bob Clampett or Tex Avery! 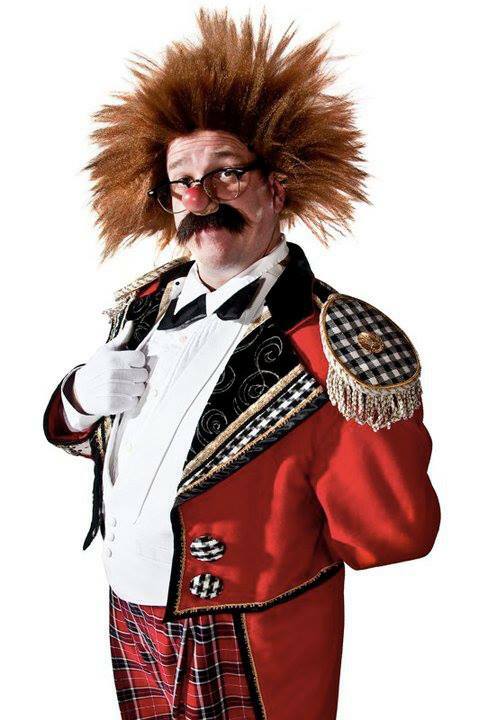 our mystery clown today is none other than... "Pepito the Spanish Clown" !!!. His name was Jose Escobar Perez, he was born in Spain (duh!) 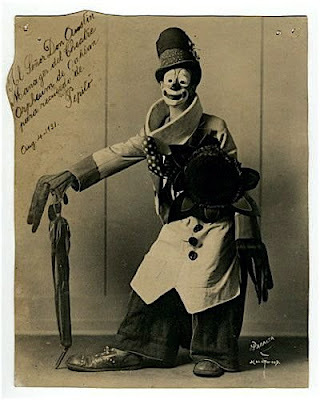 and he was a vaudeville headliner in United States for many years. 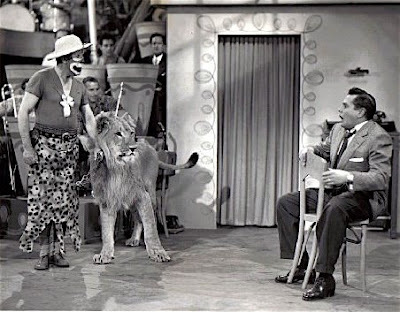 He can be seen briefly in the circus sequence of "Here come the girls" (1953) with Bob Hope, Rosemary Clooney and Fred Clark and, of course, in the famous "I love Lucy" episode "Lucy's showbiz swan song"; in it, he performs part of his stage act like the imitation of a baby and a lion tamer, and he rides a miniature bike. The trick cello Lucy uses in the pilot episode of the series, later filmed again for "The audition", was his (a couple of years ago it as sold in auction for $34,500). 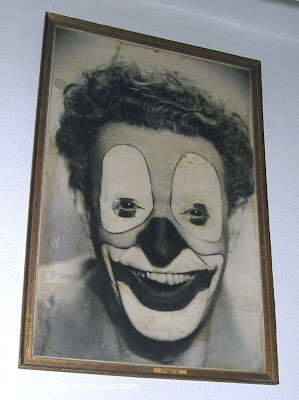 His face was a carbon copy of another famous spanish clown's, Ramon Alvarez Escudero "Ramper". Terry, Shane and I are about 10 minutes from leaving for a week in Orlando. Clownalley.net should continue as usual, but if it doesn't please understand that I am powerless in the face of a five year old boy's overwhelming desire to stand on long lines and be mechanically spun in circles with large groups of like-minded children. I have plans to get together with Kirk Marsh, if any of the other Orlando-area clowns want to meet up send me an email at cashincomedy@yahoo.com. 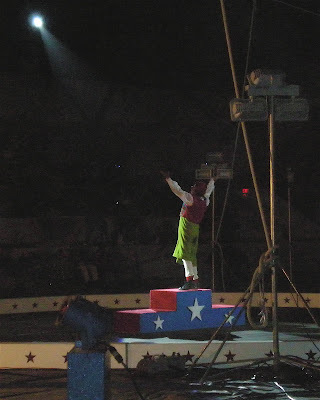 If I make the trek down to Sarasota, does anyone want to meet up at Showfolks? Hearty congratulations go out to Joel Jeske and Mark Lonergan on their Drama Desk nomination for their show CUT TO THE CHASE! It is official. 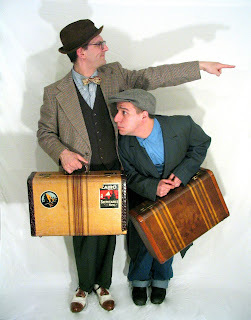 Mark Lonergan and I have received a Drama Desk Nomination 2008 for CUT TO THE CHASE. Our group is "Most Unique Theatrical Production"
Mark was given a nomination for directing. I was given a nomination for creating and writing the show. The Awards Show is on Sunday May 18th, 2008. I believe it is going to be broadcast locally. Mark and I are both freaking out. We have been nominated along side Broadway productions and Million dollar budgets. Our show cost roughly $32.50. We were told last night, while rubbing elbows with Linda Lavin and Harvey Fierstein, that what we did not have in budget we made up for in technique, craft, earnestness, and heart. Heart? Joel Jeske is capable of heart? 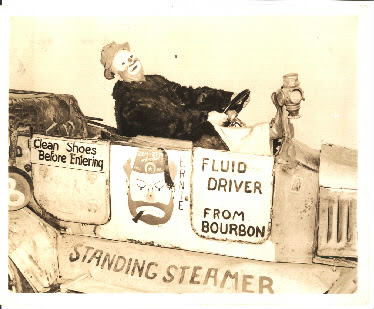 Sandy Weber sent these photos of Ernie Wiswell's car in response to the photo last week of Rex "Count de Boxcar" Young and Poodles Hanneford with Rex's comedy car. Ernie's and Rex's look identical. Does anyone know if Ernie sold his car to Rex, or did Rex duplicate Ernie's car? 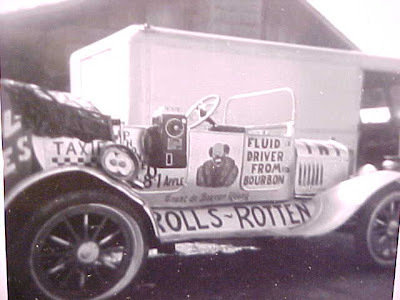 I was under the impression that Ernie sold his car to Joe Cook who left it to Jack Cook but I could be wrong about that. 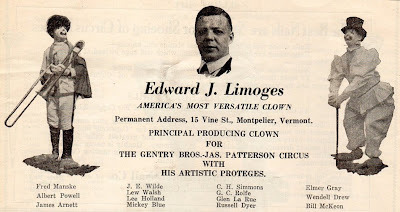 Mr. Limoges seems to have been highly thought of by the folks on the Gentry Bros.-Jas. Patterson show. I like the fact that the rest of the Alley is referred to as "Artistic Proteges". I think that I want to use "Jazz Patterson" as a stage name. That sure has a ring to it, doesn't it? 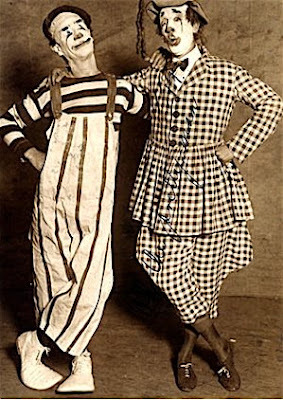 Arthur Borella (l) and journalist Paul T. Gilbert (r) of the Chicago Evening Post April 11, 1921 on the Sells-Floto Circus. To read Mr. Gilbert's account of the meeting please click the title of this post. 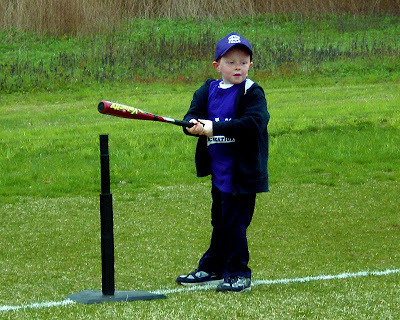 "Dashin'" Shane Cashin showed the Tinton Falls Little League that he was "Bashin'" Shane Cashin when he blasted four of 'em straight to the outfield last Saturday morning. 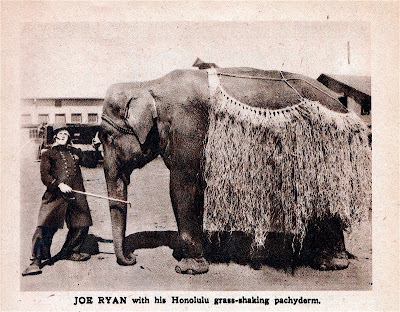 Joe Ryan, unidentified and what looks to both me and Bill like Earl Shipley. 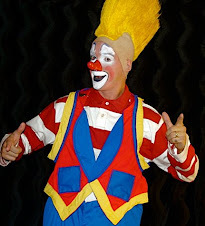 OK, this is not Glen Sunberry and it's not Keith Nelson so (other than the one on the Dr. Demento Show) we have yet another "Kinko the Clown". Bill thought that it looked like Horace Laird, which is a possibility. TIME TO GET YOUR NOSE ON! June 1, 2008- Lace up your shiny big shoes, its time for this years The Golden Nose Awards, the award show that offers all the glitz and glam of the “other”awards show with slightly less make-up. 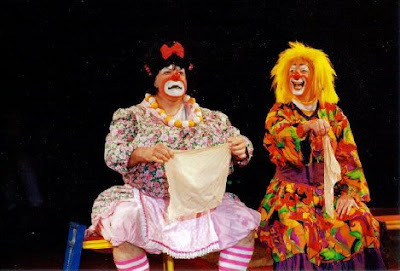 The Golden Nose Awards is the ONLY Clown Awards Show in North America. 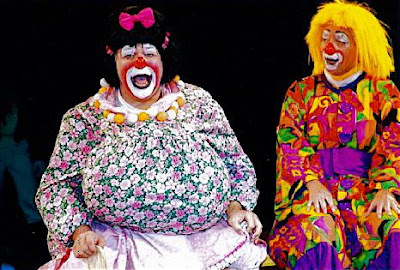 Presented by The New York Downtown Clown, This years Golden Nose Awards will take place on Monday, May 19. Red Carpet arrivals at 7:30pm (complete with the Clown Paparazzi), with the presentation set to begin at 8pm at the Kriane Theatre 85 E 4th St (btwn 2nd Ave & Bowery). Dress: Formal Attire- Noses Optional. 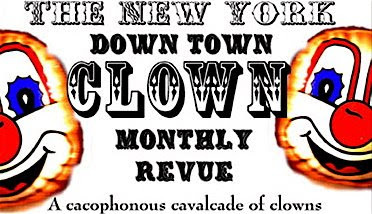 This annual event celebrates Clown Excellence in NYC from performances of the New York Downtown Clown Revue. This exciting evening will be complete with performances by the nominees, grand dance numbers, door prizes, red carpet, and audience participation in addition to announcing this years’ winners (see list of nominees below). Superstars of the Clown world will be on-hand to present the awards including Joel Jeske (Big Apple Circus, Cut to the Chase [2008 Drama Desk Nominee], Ringling Brothers Barnum and Bailey Circus), David Foster (co-producer of Slava’s Snowshow), Mark Gindick (Happy Hour, Big Apple Circus), and Hovey Burgess (The Father of the New Circus Movement). The Golden Noses are created and provided by ProKNOWS ( www.proknows.com). Your coverage for this event is welcomed and appreciated. 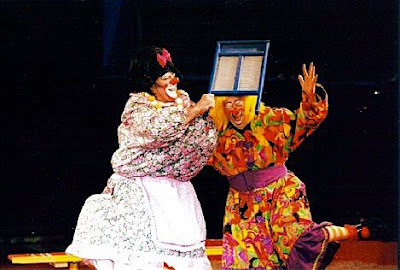 Jef Johnson performed in the August Clown Revue and is nominated for 2008 Clown of The Year for his work on the international touring production of Slava’s Snowshow, and his development of clown and clown training through Jef Johnson’s Clown Lab. 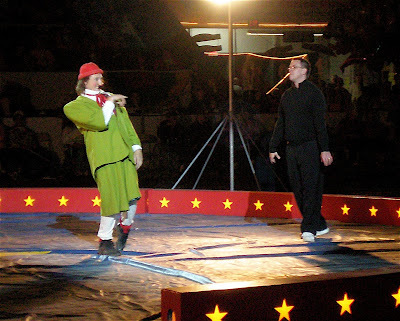 Keith Nelson performed in the February Clown Revue and is nominated for 2008 Clown of The Year for his work as Kinko the Clown, the performance initiatives he has co-created through his company, Bindlestiff Family Circus, and his teaching work at New York Circus Arts Academy, Wagner College, and several youth programs. 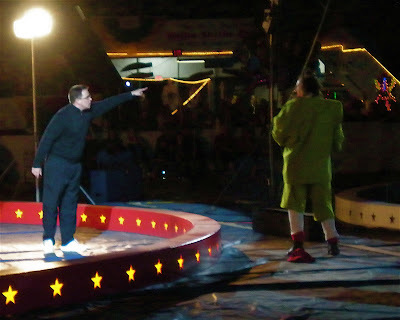 2008 Felix Adler Award winner Jay Stewart, along with his wife Kristin and children Karen & Nicholas rockin' the house in their new hometown of Harwich, CT.
On May 1st, 2008 I visited the Melha Shrine Circus in West Springfield, MA to lend some support to the clown unit and to visit many of my friends on the show. 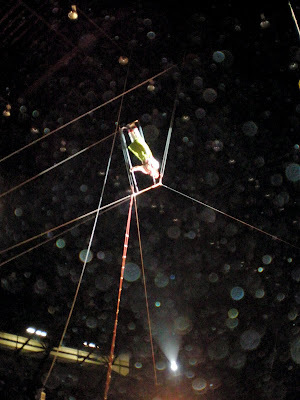 During the first act of the show Giovanni "Nino" Zoppe invited me to play straight man for his trapeze rountine which he closes the show with. I rounded up some black dress pants from my friend Adam Burck, a black sweater from Giovanni and some last minute instructions from Shane Hansen but ran out of time before I could find black socks and sneakers. My feeling is, "If they are looking at the color of the straight man's footwear, the problem is the performer and not his shoes!" I always worry that I'm not playing "big" enough, especially in giant arenas, so I am especially proud of this photo. No "spaghetti" on my plate at all! I am about to slap Nino, and every seat in the house knows it! Nino closes the show to thunderous applause. 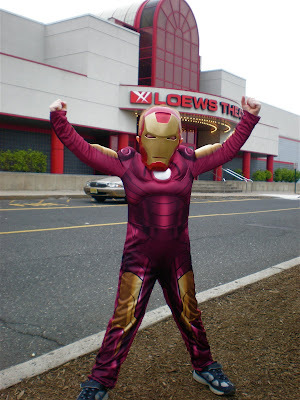 SHANE: Shane IS Iron Man!!! 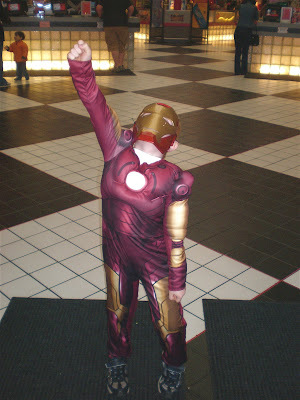 And inside the lobby, where he walked through the door to the adulation of the many Mighty Marvel fanboys, fangirls and true believers before striking an iconic Jack "King' Kirby-inspired pose for the assembled photographers. 'Nuff said! 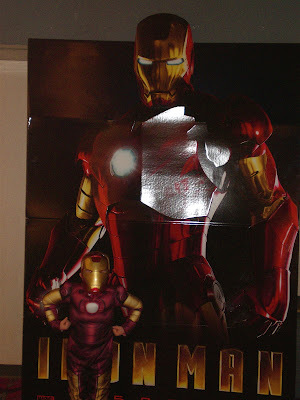 And finally, standing next to the poster outside the theater. His review of the movie? AWESOME!